Proof that the weekend started out nice. Last Thursday, I saw a bit of exciting news—the weekend was going to be bright, sunny and in the mid-50’s. Of course, I should know better than to ever trust the weather. Sure, it started out fine, but as you'll read things didn’t go exactly as planned. Friday night, I dined at a small dive bar near the hostel called Delux. While the meal was absolutely amazing, the most memorable part of the evening was my meeting of the Smiths—a very lovely couple from the area. Our conversation begin with recommendations on what I should order off the menu, before the topic turned to The Great Agency Adventure. They were fascinated with the project and even bought me a beer to help celebrate. We compared travel notes, discussed the finer points of trains and hostels, and even shared our favorite ads. I really can’t thank them enough for the wonderful chat and the kind, encouraging words they shared. The next morning, I awoke to the sounds of rain against my window. 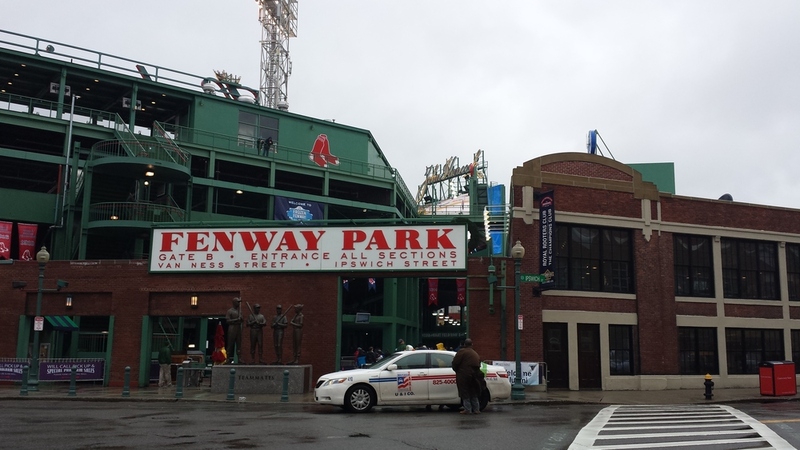 I shrugged it off and headed out the door to explore Boston. First, I headed north to check out some locations I remember from my last visit to the city—Faneuil Hall Marketplace and the legendary Boston Common. Then I ventured over to Newbury Street. Granted, I’m not a fan of the area, because it’s a little too rich for my taste. However, it’s home to the Johnny Cupcakes store and I wasn’t leaving Boston without stopping by. So, I purchased a few shirts and quickly made my way southwest. Passing by numerous historical landmarks, including the George Washington statue and Benjamin Franklin’s memorial, I began to wrap my head around the rich history of this city. It’s easy to forget just how deep this city’s lineage runs. Continuing southwest, I passed by Fenway Park, where they were showing a hockey game on the big screen for a packed stadium of fans. It was also fun to see some of the scenery I remember from The Town. About 2 hours into my walk, I passed through Allston. Now, I’m not sure if it’s considered a suburb of Boston, but it certainly feels like one. Old stone houses line quiet streets, interrupted only by its bustling town centers. If I had to describe the area in one word, it would be quaint. It was so peaceful and you couldn’t see a speck of downtown Boston, which really surprised me. No Sign of Any Green Monsters. After stopping for pizza at Otto, the rain finally began to unload. It was at this moment I realized I never packed an umbrella. Go figure. So, I waited out the storm in a TJ Maxx, before continuing on my way up to Cambridge, which is northwest of downtown. Again, Cambridge is absolutely gorgeous. It’s certainly not what I expect when I think of a big city like Boston. So, I made my way through the Harvard (I made it mom!) campus and back into Boston proper, albeit soaking wet from the relentless storms. By the time I returned to the hostel, I had walked 5 miles in just under 8 hours. Needless to say, my dogs were barking. It did surprise me though, just how compact Boston truly is. Since New York City is my only “big city” reference point, I always assume every other city is on a similar scale. Yet, you could never circle around the five boroughs in that amount of time. So, it’s cool to see how much Boston packs within its borders, while still maintaining its rich history. Sunday, I awoke with aching legs. So, I decided to cut back a bit. I passed some time searching through AirBnB listings, before eventually making my way to the Sam Adams Brewery. It was a great time and of course, the free beer hit the spot. After the tour, I strolled up Tremont Street passing by landmarks such as the Wilbur and Shubert Theatres, before catching Lone Survivor at a nearby Loews. It was an eventual weekend all around and I think I’m starting to get a feel for this city. It reminds me of Cleveland in a lot of ways. Its suburbs are actually a part of its identity, while the downtown is the bustling metropolis you’d expect. I can’t wait to see what else this city has to offer.